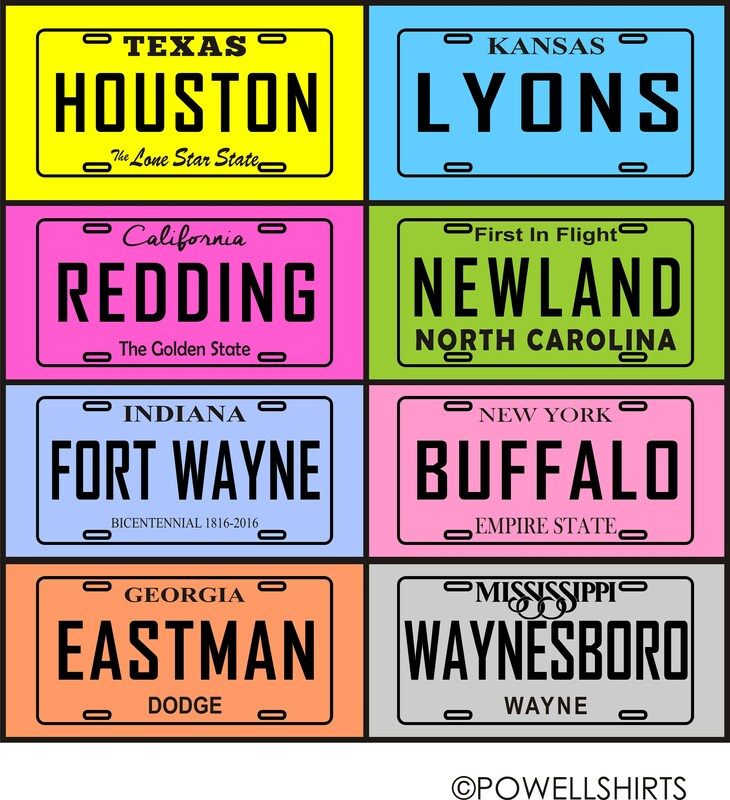 Get this high quality digitally printed (not an iron on) license plate or car tag T shirt featuring your town, community, neighborhood (or even business or school!) and also state (State logo may be used if that is normally used on license plates there and available for free use) and county (if your state tag features the county - or whatever wording they use there) - or, of course, any wording you want. 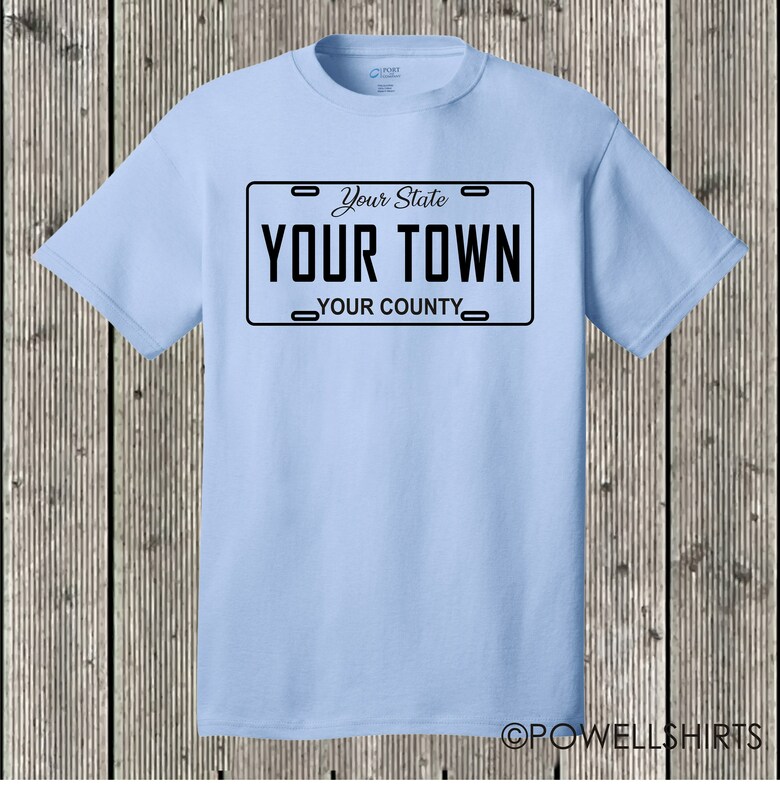 REMEMBER: When you buy, MESSAGE ME your town, state, and county (or the wording you want). Port and Company 100% preshrunk cotton T shirt - 50/50 and other blends possibly available upon request. Choose from several shirt colors in sizes 6 months through 6X! See below (very bottom of wording) to make sure your size is available in the color you want - or contact us with questions. Print color is black. Other print colors may be available upon request. Design is 100% property of Powell Shirts and may not be reproduced. NOTE: If you are a "local" customer and wish to order online and pick up your shirt at Powell Shirts, 1316 Mississippi Dr, Waynesboro, MS 39367, please send me a message, and I after your purchase, I will refund your shipping amount. Other styles, sizes (such as youth, infant, and toddler), and colors are available - message me for those. Due to the fact that this shirt is made to order, returns are not accepted unless there is a defect in the workmanship of the item, in which case the item must be returned in the condition in which it was received (unwashed). No exchanges if you order the wrong size. Please review size chart linked above before buying. Other colors are available upon request. Long-sleeved T shirts, raglans, sweatshirts, tank tops, ladies styles, and many more are available upon request. Contact us for pricing and instructions as to how to buy these. Sizes youth extra small through adult 4X are available in all colors.